02 6020 3236 Call Us Today! Have you met Rex Dundee? Rex is our Assistant Manager , however he is often confused with Crocodile Dundee (the photo’s might give you an indication why). To help you get to know Rex, he has answered a few questions that we have asked our other team members too. I grew up in Foster (Gippsland) and then lived in Pakenham for 30 years. I’ve had a varied live having been a truck driver, a slaughterman, a farmer and worked in a timber yard. I’ve owned a building company and a milk van. And I have even been a coconut cutter on an island! I ended up in Albury Wodonga because I was looking for a change in lifestyle and wanted to move somewhere with great (and varied) weather. And the job at Great Aussie Holiday Park seemed the perfect opportunity. 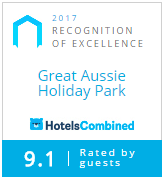 I’ve been at Great Aussie Holiday Park for five years. I’ve been give the nickname Rex Dundee because people think I’m actually Paul Hogan (Croc Dundee). What do you love most about the Albury/Wodonga region? Albury/Wodonga still has a country vibe (which I love) and has access to what ever you need. Why did you choose to work in hospitality? I’ve traveled… a lot! And I thought the park lifestyle would be interesting. You still get to meet stacks of people, but you don’t need to go anywhere! What do you love most about working at Great Aussie Holiday Park? Meeting people and seeing them enjoy themselves. And maybe a little bit of being confused with Croc Dundee! Say hi on your next visit – I’d love to have a chat.